Today Joel and I went to London. Getting to London from Paris is actually very easy. We took the Eurostar which goes through the Chunnel. The train goes very fast through France traveling at what seems like up to 200 mph but once it enters England it slows down. The whole trip takes about three hours. From the train station we were able to take the Tube directly to the hotel where we were staying. Like Paris, London has an extensive subway system affectionately called The Tube. It provided a very convenient way to get around the city. Although I'm puzzled as to why they have signs and announcements saying "mind the gap" rather than adjusting the track so the train properly lines up with the platform. While trying to find out the history behind "mind the gap" I found this amusing article about it. After checking in to our hotel we decided to explore downtown London. The first thing we did was go to tkts (like HotTix in Chicago) to get tickets for a show. We ended up getting tickets to Triple Espresso which Joel said he heard good things about. 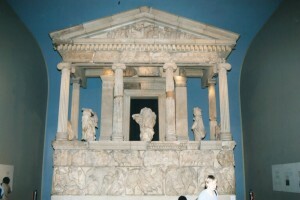 We then went to The British Museum. The British Museum has some pretty impressive exhibits, although after having been to the Louvre it felt like quite a step down. They had many different artifacts from places all around the world. Some of the items that made an impression on me where the Rosetta Stone (looking back I should have taken a picture) as well as frieze of the Parthenon and the Nereid Monument. A large number of the exhibits were very similar to what was in the Louve, but not as impressive, so we went through the museum fairly quickly. The nice thing about the museums in London was they were all free. After the museum we went for diner and then saw Triple Espresso. It wasn't as good as Joel had hoped. It was basically three guys talking about how they came to be friends and performers. I caught myself nodding off several times.